For many years now, the use of fish oils for psoriasis treatment has been hailed as a great success story. However, many people are still skeptical about these claims. This is one of the main reasons that I embarked on a short research journey to identify some of the cases that are reported to have been treated using the fish oil capsule. The presence of the Docosahexaenoic acid and omega-3 fatty acids (Eicosapentaenoic acid EPA) helps greatly to reduce inflammation in the body including those associated with psoriasis and psoriatic arthritis. Additionally, fish oil works well in the improvement of the general health and immune system for people suffering from psoriasis. The following story caught my attention especially because it does not hinge the results to any particular company or product. However, the fact that the one who posted it has been using cod liver oil and there has been some improvement in their skin condition interested me more. This next story is amazing and especially considering that, the writer mentions that he/she had tried other types of products such as lotions and ointments but they did not work. The story could be used as a clear indicator of the great results experienced by those who opt for fish oil psoriasis treatment. 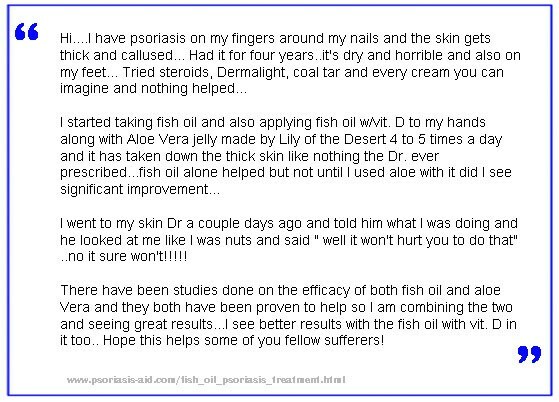 Click here to read 3 more fish oil and psoriasis treatment success stories and also 2 negative comments about this form of treatment. HOW LONG BEFORE YOU SEE RESULTS WITH FISH OILS PSORIASIS TREATMENT? Based on all the success stories gathered, it is obvious that the use of fish oil psoriasis treatment does not have uniform effects on the users and therefore the results and duration varies from one individual to the other. It is also clear that patients are supposed to use the treatment along with other substances such as Vitamin D supplements in order to make the treatment effective. EFFECTIVENESS SCORE OF FISH OILS FOR TREATING PSORIASIS? I have read many articles that propose the benefits of taking fish oil supplements to treat psoriasis. The dosage required for psoriasis sufferers seems to differ from article to article however the average advice is to take 1000 mg of Omega -3 a day. Please note that 1000 mg of fish oils is not the same as 1000 mg of omega – 3. Usually there is approx 300mg of omega-3 in a 1000g fish oils tablet. As was alluded to in the success stories gathered, you must also take Vitamin D3 in conjunction with the fish oils to maximize the positive effect. Therefore I will give fish oils on its own an effectiveness score of 6/10 but I would give it a higher score when combined with Vitamin D3 supplement and a change to a healthier diet. For sure. Most people in the western world are deficient of omega -3 essential fatty acids. Everyone not just psoriasis sufferers should add fish oils/omega 3 supplements to your diet. The long term benefits are too good to ignore, not just for your skin but also your heart, blood pressure, joint pain and mind.